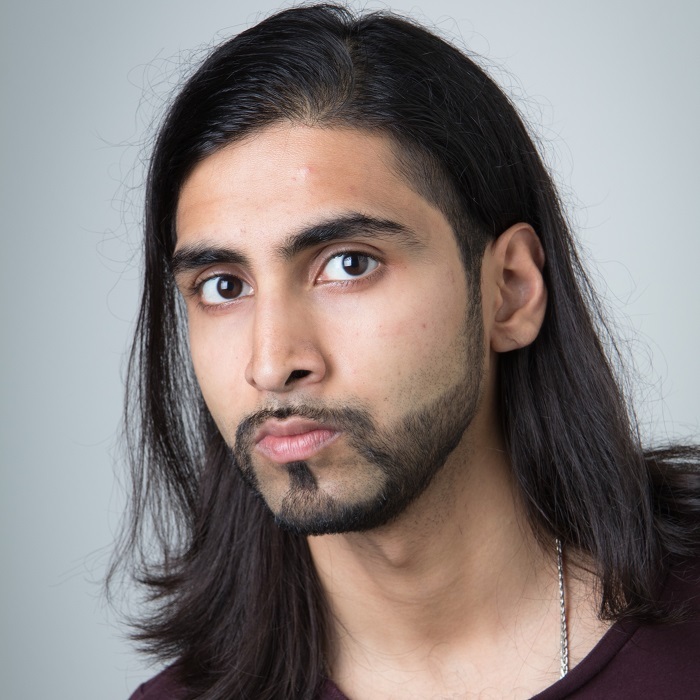 Recently, we were thrilled to announce that alumnus Kaamil Shah (MA Screenwriting 2018) was selected for Series Mania, a week-long TV series writing workshop in Lille, France in March 2019, in collaboration with Paris College of Art. (Click here to read the announcement.) Kaamil graduated from LFS ready to make waves in the industry, and the achievements he's had since graduating are astounding. We spoke with Kaamil about finding your feet, championing your voice, and how LFS shaped him. River Ferris: You graduated LFS in 2018 with an MA Screenwriting. Can you tell us about your background before LFS and how that led you to apply? Kaamil Shah: I think I've wanted to make films since I was very, very young. There's a stack of Empire magazines from 2004 in my parents' garage that can attest to that! I was a young film nerd and was watching the classics of cinema long before I had any reason to. However, I didn't really know where I'd fit in in show business, given that I was quite an academic, bookish kind of kid. I was lucky enough to meet a successful screenwriter at a careers' talk whilst an Undergraduate and that's when I realised that screenwriting was my calling. I guess that coming up with stories, characters and ideas have always been natural to me, and with my love of screen, it was a natural fit. So, after graduating from Cambridge, I tried writing a few scripts myself, but as any screenwriter will tell you, it's not a natural process at all! I definitely needed some training in the discipline and that's what led me to the London Film School! RF: You had pre-LFS fame with your viral University Challenge outfit and have championed your own unique voice since. How did you find your voice? How do you stand out amongst the crowd? KS: Oh God! I thought I'd put this behind me! Almost nobody at LFS knew about this whilst I was there! Look, like many Brits of a certain disposition, being on University Challenge was a lifelong dream. For those who don't know, it's an extremely difficult quiz show where teams from top UK universities compete against each for no prizes at all, just the glory of being on University Challenge. As I'm pretty nifty in a pub quiz, the opportunity arose whilst I was at Cambridge to compete as part of the college team and we got through to the televised rounds. But me, always a rebellious one, decided that the usual Uni Challenge uniform of Tweed and jumpers wasn't gonna fly and I instead opted to dress like a mid-'90's rapper. It wasn't even meant to be the big joke it turned out to be, that was just the way I dressed at the time, and I wasn't gonna change that for the cameras. Naturally, we got beaten terribly, but when the show aired all of Twitter blew up in outrage at the sight of an Asian boy dressed as a mid-'90s rapper on a British institution no less. I honestly thought I was just being myself but it became such a big deal around the world! At the end of the day, I've never wanted to be just another guy in the crowd. I always try to bring something different to the table. Hopefully, in the screenwriting world, it'll cause a little less outrage! RF: Your graduation screenplay combines British pop culture with South Asian immigration in the height of the ‘60s. How did you come to this idea and use your talent to execute it? KS: The idea for MR GURU'S SUMMER OF LOVE came from listening to the stories of my parents and grandparents, who came to Britain from Pakistan and India in the 1960s but experienced a very different '60s to the '60s that has been immortalised in film and television. What was particularly interesting about the period for me, was that at the same time as my grandparents were making their way in the often racist, very straight-laced working class society of the North, Indian culture had become an obsession amongst those at the top of British popular culture. Hippies and rockers alike were into the mysticism Indian religions, with all their yoga and meditation, and it didn't hurt that the Beatles recorded a fair few songs with a sitar. In this script, I wanted to bring these two worlds together in a fun and thought-provoking way. It's a story about a Pakistani immigrant from the North of England who wants to be a rock star so much that he fakes it as an Indian guru. It's full of cultural references and some comedy I'm particularly proud of. I'd love to develop it further! RF: You landed a talent agent straight out of your MA. How did you go about this? KS: It didn't feel as soon as it might appear! I emailed quite a few talent agencies with no reply and the rejection can be quite tough, but I was really lucky to have been found by my wonderful agent Alex Cory at Berlin Associates, who read a sample TV pilot I sent to the agency and picked up the phone. We had one meeting after that and it seemed like a more than perfect fit. Alex represents a lot of similar writers to me, and really loves my work, so I had a good feeling going in, and it's safe to say that she's been exceptional since organising a ton of meetings with really cool production companies and linking me with producers who seem like excellent collaborators. I feel lucky in having found the right agent so early in my career, but I would put a lot of it down to having writing samples that are unique and speak very clearly to what I can offer as a writer. With my TV pilot and Spec Screenplay, an Agent like Alex was able to see what I could offer and get interested in representing me. Like with everything else in screenwriting, it's all about voice! RF: How and why did you apply for Series Mania? KS: I have a policy of applying to every single writing scheme under the sun, even if it seems like a long shot. And Series Mania really did seem like a long shot, as most of the writers on the programme have bags more experience than I do and it's linked to a highly prestigious European TV festival. But the surest way of not getting ahead is never applying, so I had to put something together. And luckily for me, I did have a TV drama project I was keen to develop further that seemed perfect for the programme. So I applied, and was lucky enough to get a place! I'm ecstatic and cannot wait for the opportunity to work on this project and meet writers from all over Europe, as well as experience the festival! RF: How did your MA Screenwriting course help you achieve these successes? KS: I cannot begin to describe how much I developed and learnt over the year of my MA. I guess I'll distil it into a few key aspects. The most important was spending an entire year thinking about Screenwriting and nothing else. You really can't put a price on having the mental space to focus on developing your craft, and I really benefitted from the opportunity to do so. The second most important was developing my craft. Every time I sit down to write there are a thousand buzzing soundbites in my brain about what to put on the page. How to write convincing drama, how to open and close a scene, how to develop a character, what works and what doesn't in comedy - the list of lessons I picked up in class and from the tutors at LFS goes on. Screenwriting really is a craft, it doesn't come naturally even to the greatest novelists, and being instructed in the craft by teachers as dedicated as those on the Screenwriting MA is a privilege I would be nowhere without. And finally, I cannot overstate how helpful our exposure to the great and good of the British film and television industry was in helping me enter my first year in the business. Thanks to the hours I spent listening, I can hold my own in meetings with producers, know how important networking is and have a sense of what might sell when I start writing. RF: What advice would you give to aspiring screenwriters and other screenwriting students? KS: Well, I'm truly flattered that anybody would think that little old me is in any position to advise the aspiring screenwriter, as I still feel very aspiring myself, but there are some things that have helped me along the way. Number one is staying positive. There's a lot of rejection in this industry and you really can't let it get to you, the maxim that 'it only takes one yes' is the truest of all, in my opinion. Secondly, I recommend applying to all the Writing Schemes out there. There are tonnes of opportunities for new writers out there and even if you don't get in to any of them for a while, the very act of applying should leave you with more than a few samples that might be worth talking about! And finally, although I believe this is the part where most writers will say 'WRITE WRITE WRITE WRITE' I would actually say 'WATCH WATCH WATCH WATCH.' All the best screenwriting lessons can be learned in front of a screen, and you've got to have a good understanding of what's out there if you want your own writing out there too! RF: What else have you been working on since graduation? KS: I am mainly working on TV projects at the moment, as it's a little easier to produce and there's a ton of interest in high-quality TV right now. The one that has received the most interest since graduating has been my comedy pilot COUNT ABDULLA - the story of a young Muslim who finds his faith conflicted when he receives a vampire bite. The project I'll be bringing to Series Mania is DUBAI ON THAMES, a political thriller about a journalist who uncovers the crimes of corrupt oil sheikhs in Modern-day London. Most of my time now is spent away from Final Draft, unfortunately, as I've used my knowledge of film production to take a job in Advertising, where I'm a Producer for some fairly high-budget commercials. It's rewarding work, but I can't wait to get back into screenwriting as soon as the next opportunity arises! You can read more about Kaamil here and visit his agency page here. Series Mania takes place 22-30 March 2019.